What to do when in Cebu? Join me as I go day by day telling you our experiences when we attended the Sinulog Festival in the Queen of the South. This is a four-day series of our hunt for experience during our five-day stay in Cebu. Our fourth day is almost bittersweet since we realize that we’d be heading back to Manila the next day. We decided to have a quick brunch down Casa Verde in Ayala Mall. They say it is Cebu’s version of TGIF serving American-style casual dining; so might as well try it. I was a bit shocked with the humongous serving they have. We did not quite expect it; but definitely enjoyed the whole experience. After lunch, we felt really bloated so we decided to have tea at the beautiful Circa 1900. I am always gaga over ancestral houses converted into a cafe that’s why I truly enjoyed the experience. The house is just stunningly beautiful giving you the perfect ambiance to relax and hang out with friends. Not to mention the very accommodating staff which will make you feel really special all the way. Past after tea time, our friend invited us to check out the hotel where he is checked in. It was amazingly beautiful to say the least. I highly recommend anyone going to Cebu to try checking in at Henry’s Hotel. It had a very young and artsy feel all over. The room is very huge and the gallery up the 3rd floor is just simply wonderful. It is my type of hotel and truly one of a kind. It definitely reminds me of a New York City apartment that has a very industrial and artsy design. A little more killing time inside the beautiful hotel before we prepped up for our last party night. We came in early to check some of the establishments down the City Time Square for another Globe Tattoo event at the Liv Super Club. Of course we had to have dinner and so we checked out Cebu’s Original Lechon Belly restaurant inside the square. The boneless spicy lechon is just simply amazing. We enjoyed eating it by hand using disposable plastic gloves. After another heavy meal, we went across the other side of the square to kill time at Café Nomoo. It definitely gave us a different café experience. The entire interior is covered with people’s post-its and photos. 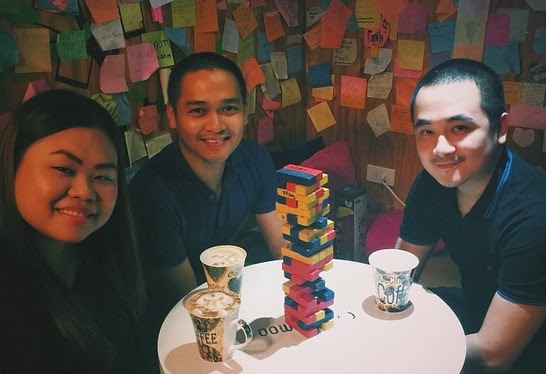 Instead of coffee tables and chairs, customers can go inside a wooden partition that mimics double deck bunk beds. Inside each section is a small table and pillows so you can lie down the floor while you enjoy coffee and games with friends. For PhP10.00 and an ID Deposit, you can borrow game materials from the cashier so you can play it with your friends. In our case, we played Uno Stacko and Scrabble. Midnight hits the clock and the party has officially started. We welcomed Sinulog with a grand fireworks display. Thanks to our friends from globe, we were given a VIP access to party the night away. We got really wasted the entire night. It was so much fun to see everyone enjoying the very wild part down south. That’s when I was convinced with what they say that Sinulog is the wildest festival in the Philippines.